Last Minute Racing wrote: Coopers Sparkling Ale long neck with a cork in it?? Nice looking bits from the States BTW. Is that a combustion leak into the jacket ???? and why are the heads running at two different tempratures ?????? what does the top of the pistons look like ?????? ROSS BROWN wrote: Is that a combustion leak into the jacket ???? and why are the heads running at two different temperatures ?????? 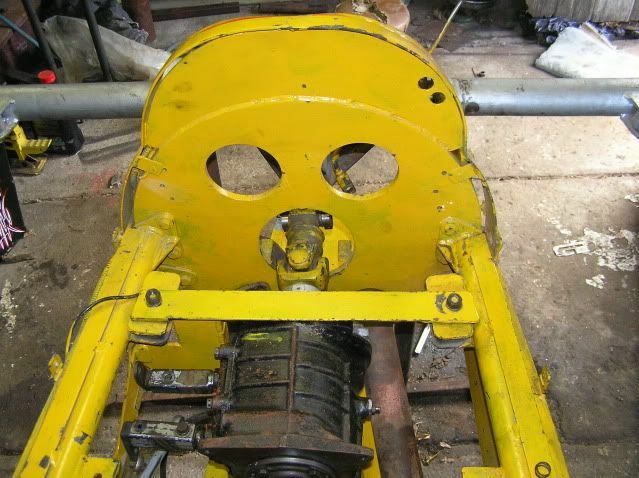 Take two: We found a project build on eBay that had fallen over which had pretty much all the same bits that were in the motor we just wrecked , it cost less than the rebore of one of the blocks we had would have cost . A machined block with new pistons a manual crank and all new bearings and gaskets. just needs a little bit of a lick in the bores. The Colonel is going to get the pistons coated. The considered opinion is we got the most out of that motor . 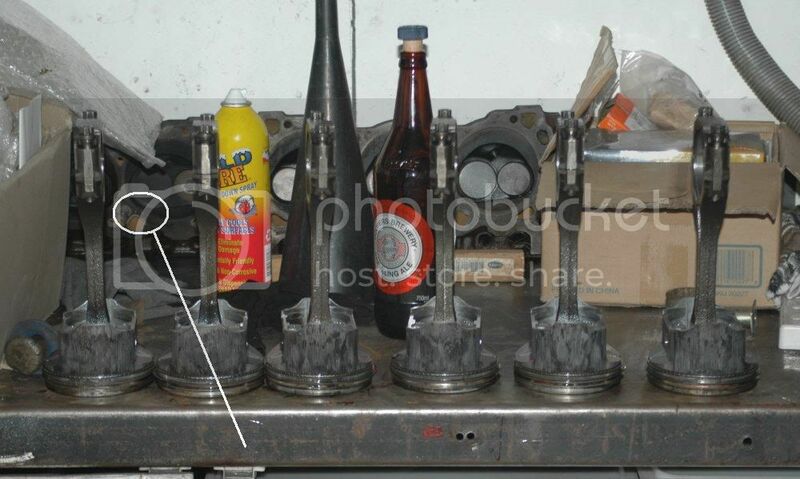 It was leaning out, shown by the pistons tops and the blueing , the unbalance and the loose flywheel caused the crank to flex which hammered the bearings letting the oil out , the scuffing was probably a combo of both the heat and the low oil pressure and too tight clearances. So more fuel, some tidy oil mods( and more of it) a rethink on the crank-case vacuum and some coating on top of the slugs, a proper manual crank so we don't need an adapter boss and a proper balance.....this year we'll be able to see, and with a bit of luck we'll get 200. We have done the basic clean up on the frame , degreased and descaled and then slopped on a bit of enamel to keep the tin worms at bay. The new engine build has started, we had an issue with the cam grind , that has been sorted out.we had another problem with the timing chain as we are using a series two cam in a series one block and neede to change the thrust plate on the cam.We have a bit of high temp ceramic on the exhaust and manifold courtesy of Andrew at Competition Coatings in Coburg.A new set of injectors after discussion in the camp about going to bigger injectors we opted for a brand new set of standard ones , allowing us to use the standard fuel pressure reg and avoid a full remapping of the fuel. Last years pile of scrap, motor, seemed to have leaned out on one side..... we are adding another vac-u-pan and this time the it will run to the crank-case breather rather than off one head which is another issue that had been debated in the "camp". So,the motor is running a very long duration cam(specs elswhere here), 9.6:1 comp , solid valve train and the Trick and Mansweto heads I picked up last year. We might get time to make a larger sump. 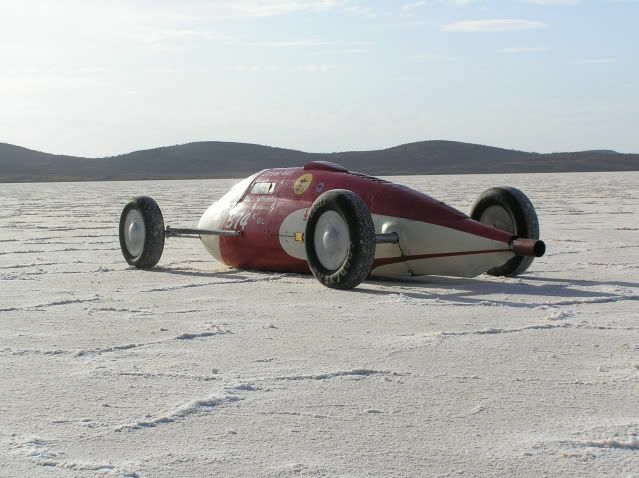 We have made the stipulated changes we were required to do for the scrutineers, main shut off on the hot side of the battery with a switch on the engine bay extinguisher, more drain holes in the bottom of the body, and a wiring tidy up.Though not mentioned we will be shortening the cheek bars . We have a new fire suit this year, SFIO3.2/20 that I bought second hand from the states and had re-certifed at Deist. We also have a new SA2010 helmet on the way from the US. Despite the tired old argument about $2 heads the pricing on helmets is outrageous and the scrag fight about rating standards is dodgy too, I'm here to say we should be able to use FIA. 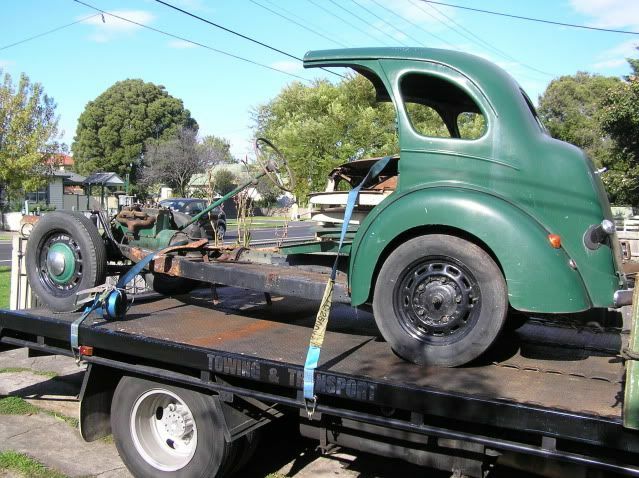 I've bought a Ford Trader tow truck, just a flat bed 3 litre diesel.....we know how the car is getting to the lake this year, slowly. I've decided to leave the "transport" tyres at home this year and will just tie the car down on it's belly with some old tyres undrneath her. Just in case anyone is wondering , it's not a good idea to trailer your car with the lightweight carcass race tyres on it. I just called John Nightingale from Wormald to re-check the extinguishers, after a debacle in our first year we have elected to empty them each year, store the ColdFire in a lightproof plastic container and have them refilled each year. It eliminates the risk of the AFFF coagulating and blocking the dip-tubes making the unit inoperable and also eliminating the risk of the contents eroding the aluminium cylinder , it happened to the first four we had. Annual checks , cheaper than replacement and good peace of mind. 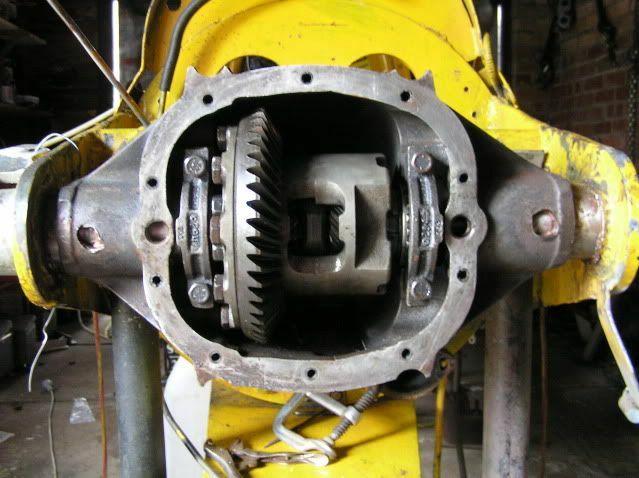 I'm edging ahead on the differential transplant job....from the Borg Warner to a GM 10 bolt. I had a crack at removing the plug welds that hold the axle tubes into the centre housing on the weekend, I am not exactly sure where the material sits on the *GRTOH( generally recognized table of hardness)but it was harder than what they make drill bits out of....I had a certain Colonel suggest cobalt drills....I baulked at the price and anyway I flattened the tip of my centre-punch on it, another suggestion was stellite... but they'll cost me $200 and then I still have to mount the diff centre somewhere on my drill press table and that strikes me as potentially troublesome. 1./ Harder than goats knees. I could have a crack at them with a torch but the housing is either grey or graphite iron and will likely let go before the weld . The welds look to be about half an inch dia. and as I said they are so hard that they took the point off a centre punch, I made a well in one with a burr ( so a drill could at least start)but a bit still just felt like it was sitting in a bearing, made heat and made the bit blunt but that was it. All of the welds have a bubble in the top of them which makes it look like they were very hot and then probably because of the bulk of the housing cooled very quickly and are probably pure martensite. "we take them out with a torch----leaves room for BIG rosett welds thought about trying a hole saw!!!" A stone bit in an angle grinder? (yes masonary as in concrete) and then grind a face on the bit. "er how much does he want for it?" The original idea was to build a small tube chassis......hmmmm, but now I have one I can narrow a lot and shorten a little....check out the cute little steering box. Ford Motor Company of Dagenham designed the 10hp 7W car for launch in March 1937, of a style and design which to which the new motor user was to become very attached, and where Ford parted from vehicle model designation of identifying letters and numbers to name it the 'Prefect'. To the motoring public it became the 'Ford Pop' or 'sit up and beg' Ford. 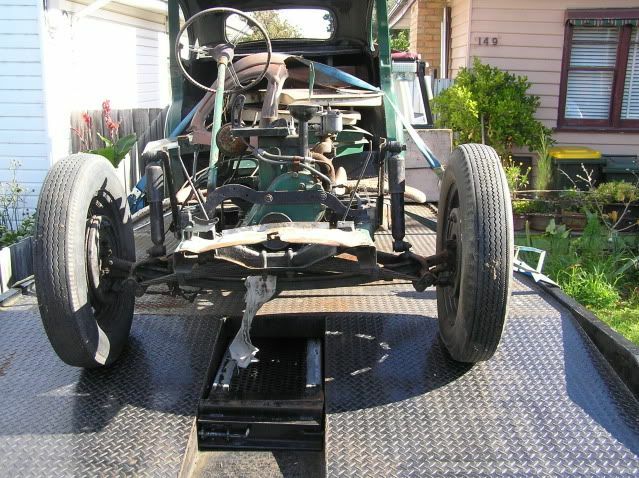 The 7W Ten used the 10hp 1172cc side valve engine, on a 94" wheel base chassis, continuing the proven layout of transverse front and rear spring with torque tube. The 7W was offered in both 2 door with 4 light (side windows) and 4 door (6 light) form, all with deluxe features, fold down boot panel and removable spare wheel locker lid, opening windscreen etc. The frontal and side aspect of this model was not dissimilar to the more basic 7Y model offered later with 8hp engine. However the launch of the Prefect E93A in 1939 showed many differences. Gone was the sloping front cowl to be replaced by a V shaped radiator grill, the centre hinged bonnet gave way to the 'alligator' type bonnet of one piece hinged at the rear. From now on the Ford Prefect was only offered in 4 door (6 light) saloon form on the home market, as it continued until it's demise. There were variants of tourer and van, these were offered only for the export market. 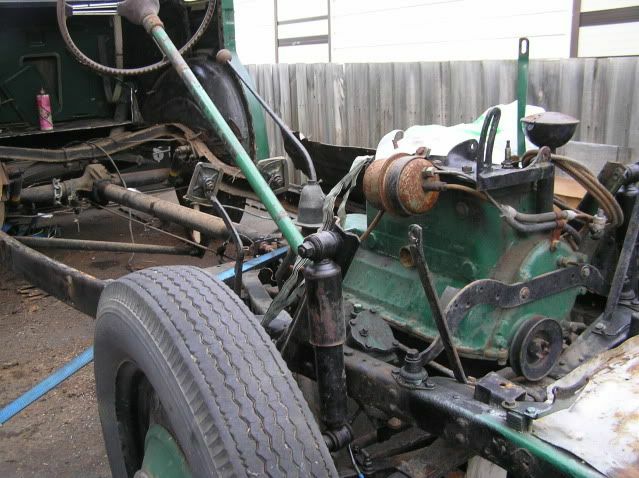 The Australian market, at this time assembling knock down kits and part builds at the Geelong assembly plant, had additional models of E03A produced 1939 to 1945 and A53A produced 1946 to 1948 in car and van form, these were exclusive to their own market. In 1948 the Ford Prefect E493A was given another slight make over externally, replacing the previous free standing headlamps to those set into the front wing. Over the production period of the Ford Prefect 'upright' which finished in 1953, the vehicle remained virtually unchanged, there were slight alterations, a swage line here, a badge change, interior detail changes etc, but it retained rubber running boards throughout the production when other manufacturers had radical style changes. Ford replaced it with the Ford 100E Prefect at the end of 1953, but the success of the 10hp Ford Prefect E93A and E493A together with the export variants achieved a production build of 320,336 units. This in itself was an achievement which Ford could have been proud of. The fledgling motoring public took the Ford Prefect to heart, the cars served well, enabling those days of 'happy motoring' to be enjoyed by the masses, a true family car, one of the Ford family. These vehicles are still worth preserving, capable of giving good reliable service. Do not be in a rush, they are not a sports car, custodians of survivors get great pleasure and enjoyment from using these vehicles which are very capable of normal motoring use at a very comfortable speed. 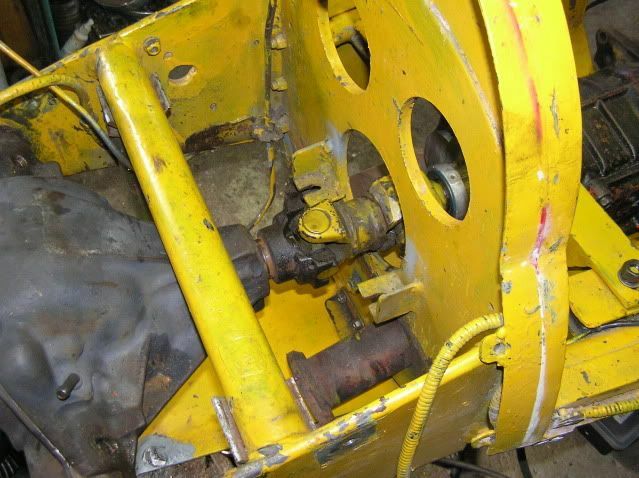 The 10hp 1172cc Ford Prefect restorer or repairer is able to obtain most items required for continued use and maintenance from specialist mail order spare parts suppliers, who are able to ship world wide. further details please click here. Wait a minute.... Its a Ford!!! What kind of confused bi-brand kid are you? This is Australia mate, and it is either Ford OR Holden, as George would say, you are either with us or against us ( rolleyes). Here are the dimensions of the frame anyway, I can model her up in no time to test various ideas. Just need dimensions of the tank! 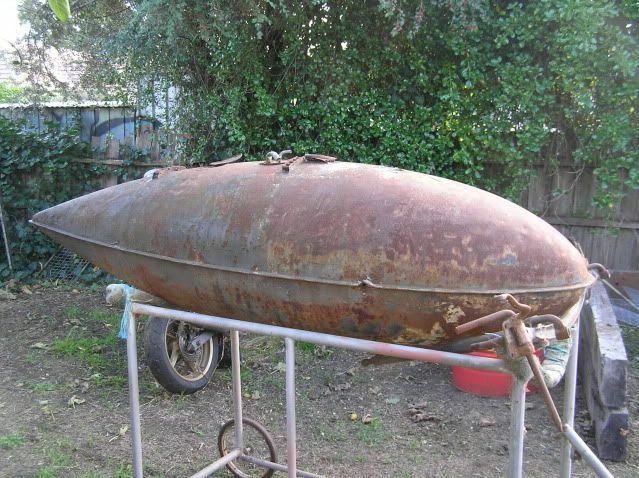 You still haven't answered my question... is this to be a racing tank or Belly tank lite? I sent you a text yesterday saying ...."I'm not building another race car anytime soon"....... 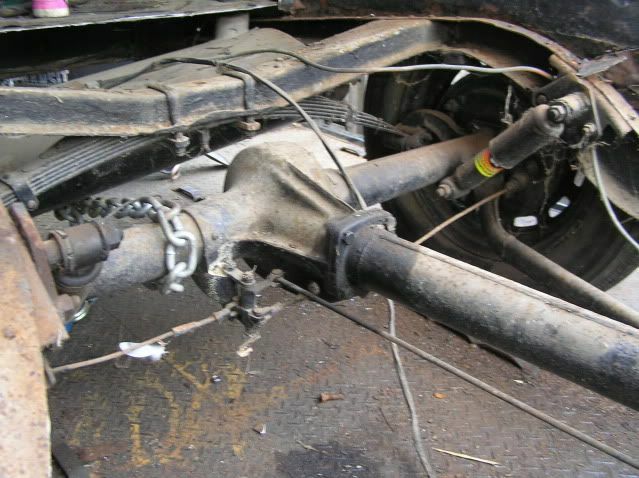 This will be a back in the day job....narrow the chassis after lopping it fore and aft of the transverse spring mounts......it's ten inches longer than it needs to be, I can narrow most of the cross members......box the frame rails in . Check now for any sticky bits on your head that could in fact be an entry wound. Phone flat yesterday as I was, got some crappy cold that makes me feel like I've smoke 20 rollies without any filters. 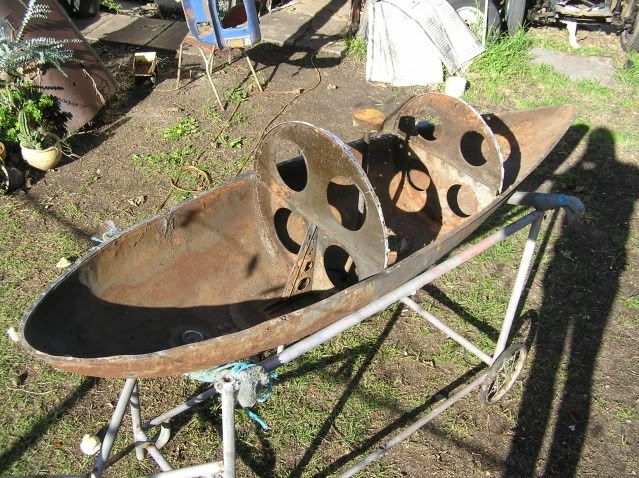 Given this is steel what say we cut it in half first so we know excatly what we are playing with? This one is too small to waste any millimetres on the interior. I can come around this weekend with a big sheet of paper so we can get an acurate measure regardless. I spoke to Wayne Mumford a month or so ago. He bought Russell out and has remotored the tank with a 2litre Toyota which has been "built".......he's been having a little rest from the DLRA but has built a trailer and will be there next year, it'll go fast. Its fairly obvious what you've done here Doc. Just to get your thread over the 100k hits you had to go and buy a Ford. Plasma cutter? For your hole issues?? momec3 wrote: Its fairly obvious what you've done here Doc. Now, from the pointy end it's just over 800mm to the small bulkhead, that's enough for the rear spring,rear end and motor assembly. We got some way into the job to fit the housing for the ten bolt rear end. After having a crack at pulling one of the inserts in last week we elected to have a closer look. 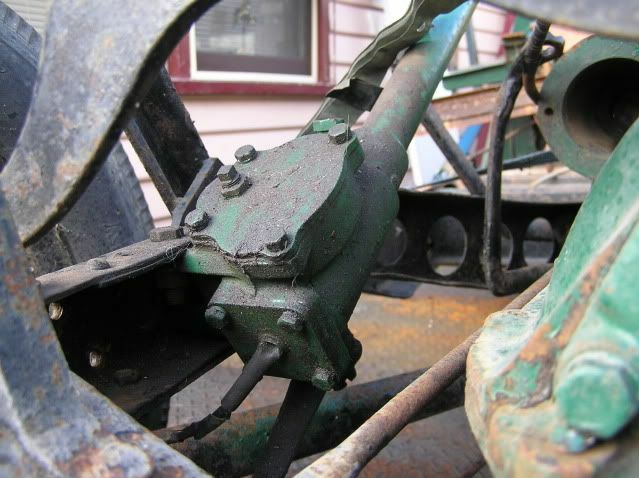 It seems where the axle tubes were welded into the frame that they were pinched a little by the cooled weld. We took to that with a stone and then gave it a polish with a flap wheel, on the next try the progress was a whole lot more even.Next we had a look at the housing itself. due to the way things had to go together we needed to pull the inserts from inside the housing, that meant there had to be a clear path. 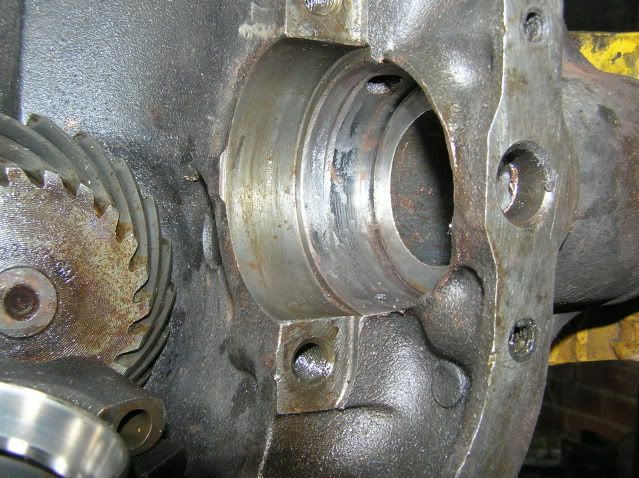 Turns out that the machining wasn't perfect and the axle "hole" didn't line up exactly with the relief behind the bearing seat so there was a bit of de-burring and clearancing there too. The movement had been slowing, the force applied increasing......we paused to assess...."so,where is it moving? "....I gave it a few more turns and there was a resounding TWANG! followed by some tinkling of parts, the washer on the right had given up the rod pulled through the middle of it and the washer went flying, we figure from where it ended up that it went between the Reverends legs.......unseen. Nothing was broken, the legs had popped back to straight. I figure we need to use a porta-power to push the inserts from within the housing as well as pulling them. 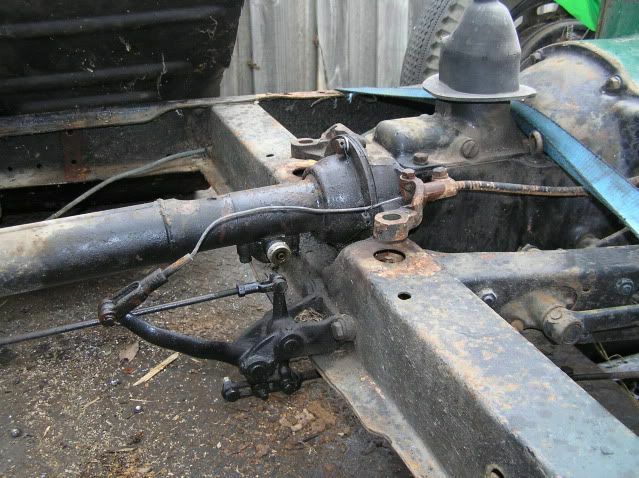 we have plenty of side to side adjustability, we need to do a trial fit to see that the stock Ford axles will be the right length with the centre in the centre or so to speak. This is just another example of "you had to be there to understand why we did it this way". I wandered out to the shed this morning and had a good stare at the job. Staring at the job has been an integral part of many things I have done over the years,in fact if it weren't for staring at the job most things I have tried would have reached a conclusion, successful or otherwise , much sooner. So, at that point I decided to do something. The first few swings on the pipe that I was using as an extension weren't promising, it didn't have the firm but even feel telling me it was moving....I thought "maybe the thread is a little tortured" so I went to the other end, that felt better...... I should have put the Torque wrench on it so I could give you an exact figure but it felt like close to a hundred pounds on the 12 inch wrench I had on it. Something else I'd like to point out about this transplant job. 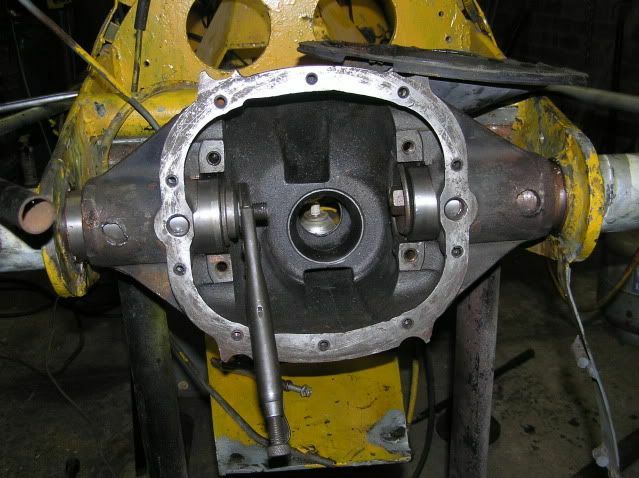 The way our rear end is mounted places a lot of stress on the join between the differential housing and the axle tubes because it is supported so narrowly. Rather than being supported at the spring pad as designed where the leverage against the housing would be minimal the support is in against the housing where it has probably twenty times the force at the wheel.Thus the rather heavy duty solution for attaching the housing to the tubes and the tight fit that we have gone with ......just in case. Now, the Colonel turned up today and we got cracking .....He brought over a piece of 7/8 all thread which was an improvement on the 5/8 stuff I had....but he also brought the socket wrench of DEATH !..........sadly I didn't get a shot of it but it had a handle like a baseball bat...but wait ! there's MORE......it telescoped out to about twenty feet long...OK I didn't put a tape over it but it was pretty long. 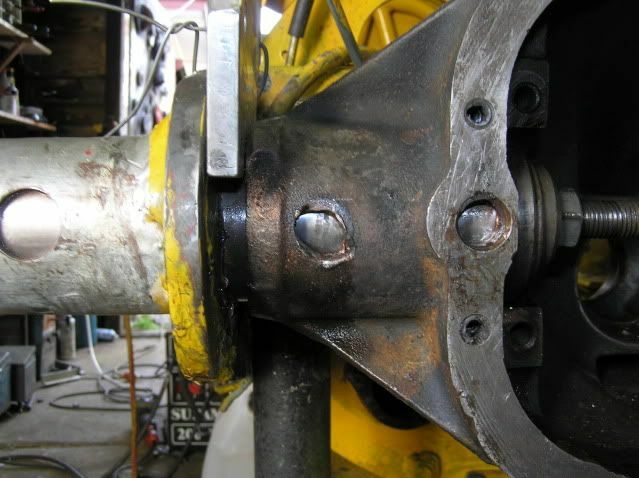 we pulled the inserts out to where they covered the prepared holes for the plug welds at one end and cleared the reliefs for the bearing seat inside the housing..